Matthews Wall Anchor has an excellent reputation for repairing settling structures in the Pittsburgh, PA area. With more than 30 years of experience, we have become the leading commercial structural repair company in the state of Pennsylvania. We provide excellent, professional service that shows in every foundation repair project we complete. Commercial structural repair requires the right materials and products in order to support the needs of large structures. Our products are from Earth Contact Products, the leading foundation repair manufacturer in the industry. Our team of experts, including structural contractors, are fully trained to handle all of your commercial needs whether they are large or small. Our goal is to give you proven solutions to lift and support your foundation. Underpinning Solutions can be installed from the interior or exterior of your structure and, once installed, the building is immediately restored. Piling Solutions are installed quickly and in areas with limited access. This solution resists both axial compression and tension loads. 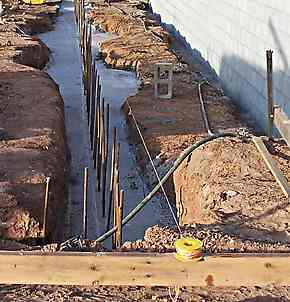 Shoring Solutions can stabilize a cracking or bowed foundation wall and are quick and easy to install. Every professional underpinning project should start with the hiring of a civil engineer. By hiring a civil engineer, you will be ensured that the construction project is completed in a timely manner and fixed correctly. At Matthews Wall Anchor, we know the importance of having a skilled civil engineer on a project, so from designing complex construction projects to supervising jobs, our civil engineers can tackle any commercial project in the Pittsburgh, PA area. Our engineers design, build and maintain the foundation in roads, tunnels, buildings, bridges, dams, and many infrastructures. Matthews Wall Anchor offers structural solutions for buildings, retaining walls, and other structures in the Pittsburgh, PA area. We use underpinning, piling and shoring methods to restore your structure for many years to come. Contact us today for more information about our service.